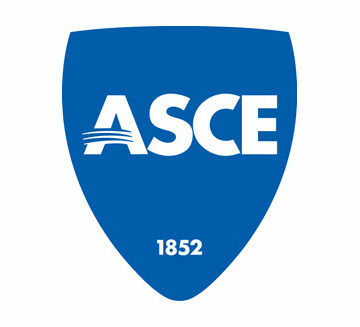 The ASCE Board Executive Committee approved recommendations from the Committee on Student Members to establish new protocols for ASCE Student Chapters, steel bridge participants, and Student Conference organizers affected by the recent change in the Student Steel Bridge Competition. With the exception of the Student Steel Bridge Competition, ASCE plans to maintain an ongoing working relationship with the American Institute of Steel Construction, and will continue to collaborate on technical standards and activities. • The AISC Steel Bridge Competition will only be sponsored by AISC, and therefore is no longer recognized as an official activity of ASCE Student Conferences. • ASCE Student Conference hosts who do not wish to include the AISC Steel Bridge Competition in their program are not obligated to do so. 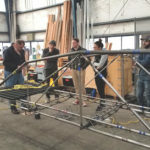 • If host schools desire to have an AISC Steel Bridge Competition, they should treat this as a separate event from the ASCE Student Conference, requiring separate funding, registration, and liability coverage for the AISC competition. • AISC steel bridge teams are no longer official activities of ASCE Student Chapters. • Individual students may be members of both the AISC Steel Bridge Competition team and the ASCE Student Chapter, but all recruiting, fundraising, and preparations for the steel bridge team must be kept entirely separate from ASCE Student Chapter activities. • All civil engineering students are encouraged to maintain their individual memberships in their ASCE Student Chapter. In addition to the new protocols, the Committee on Student Members authored a Frequently Asked Questions document to help guide Student Chapters. ASCE has appointed a task force to address the long-term need for innovative, global student competitions. AISC announced July 27 that it would terminate its long-time partnership with ASCE for the National Student Steel Bridge Competition, effective immediately. ASCE has stated that these changes are incompatible with its organizational mission and values. “ASCE strongly believes that ASCE-affiliated competitions should be open to all ASCE student chapters that meet eligibility standards for national competition,” read a letter from ASCE President Kristina Swallow and ASCE Executive Director Tom Smith informing Student Chapter advisors of AISC’s decision. This would include teams currently participating from student chapters located in Canada, Mexico, and China. AISC organized the first local steel bridge competition in 1987, in Michigan. A national competition followed in 1992, and in 2000 AISC and ASCE signed their first agreement to include the steel bridge competition as an official ASCE Student Conference event. An estimated 10,000 civil engineers have participated in the competition as undergraduate students. As past member and president of the Committee on Student Activities I am sad to hear that AISC has decided to break this relationship with ASCE. The focus of the competition is and has always been to have students learn through teamwork, setting goals, time and people management within the student chapter organization. The competition itself is a culmination of all the hard work and planning that that the students and the Student Chapter puts into the journey, the later being more significant than students realize at the time. 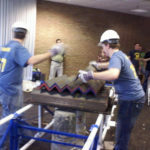 The next couple of years will be challenging to see where the bridge competition morphs outside of the confines of ASCE student chapter organizations and national leadership. Perhaps the ASCE student chapters can come together and propose alternate competitions using steel or alternate metals to design and erect buildings, towers, etc. or include interesting aspects to a future competition such as a jib crane or monorail; and to include wind and/or seismic provisions to align with the fundamentals of ASCE_7. The possibility to create a new competition beyond bridge design could enhance the creativity of the student’s minds while still maintaining the teamwork and camaraderie that has always been the main goal of the ASCE Committee on Student Activities. I cannot speak for chapters, universities, or students. While judging the Texas-Mexico competitions for the last four years after participating in college, the aspiration and hard work of students I have witnessed to make the steel bridge and concrete canoe team timelines, shows strong future Engineers. These competitions prepare students for the demand of the work force. During whirlwind semesters, they put in work all year long to be ready for both these competitions. I believe this separation won’t deter our universities from Texas and Mexico to participate in both CC and hopefully SB 2019. Even if it’s not national recognition, build epic concrete canoes, and develop inovative steel bridges, because regardless of politics, these Engineers are our future. I understand the AISC Steel Bridge Competition is no longer associated with ASCE. But is there anything in ASCE policy prohibiting the establishment of a new ASCE Steel Bridge Competition? It would not enjoy the previously generous financial support of AISC, of course, but it could still play a starring role in the ASCE student conferences along with the ASCE Concrete Canoe Competition.